Korea. Tel: +82-2-380-5809 . E-mail: pjkim@chodang.ac.kr. University, Korea. Tel: +82-10-2263-7292. E-mail: retail21@hanmail.net. Received: August 12, 2013. Revised: April 20, 2014. Accepted: May 22, 2014. Purpose - This study aims to understand the brand marketingof agricultural products and redefine their status in South Koreaby analyzing impacts on consumer buying behaviors. Research design, data, methodology - Products, with independentvariables, were divided into agricultural brand productsand generic products. Dependent variables were limited toexpanding sales of a specialty brand through consumer awareness,consumer buying behavior, and confidence in agriculturalproducts’ quality. Control variables were based on characteristicsof products such as freshness, safety, quality, and theircategory. Moderating effects were examined on consumer characteristics,including income levels and age. Results - Consumers increasingly purchased agricultural brandproducts rather than generic agricultural products because of thegeneral reliability of quality assurance. Conclusions - Large agricultural specialty stores have enhancedthe perceptions of quality assurance, freshness, safety,and diversity. Through a critical analysis of the domestic consumerincome levels and age, gender, and demographic factors,such as agricultural consumer buying behavior not affecting consumers'health and life, this study proposes positive changes inquality perception. JEL Classifications : M21, Q13, E03. Key Words : Consumer, Buying, Behavior, Agricultural Brands. The liberalization of agricultural trade around the world has been actively discussed recently. There are domestic agricultural products with increasing competitiveness due to increasing agricultural imports. The competitiveness of domestic agricultural products and the differentiation strategy has emerged as an urgent task because of varying consumer needs for food consumption. As a result, the actors such as producer organizations, municipalities and government, have been branding agricultural products using a variety of strategies to promote differentiation and development of agricultural products. Due to changing market conditions, agricultural distribution markets try to determine all the marketing tools to meet the needs of customers including the QoS (Quality of Service) and various value up like store brand, economic value, and store convenience(Kim, 2012). The customers will increase awareness through branding of agricultural products. In example, agricultural product, like eggs, it is very import to decision making for customer purchasing because of quality and safety so that brand name is very important(Kim, 2013). Now a day, Consumer wants to well-being foods in accordance with "do well by doing good"(Lee, 2013). This can create added value of agriculture and improve competitiveness through market differentiation. The purpose of this study is to know whether the agricultural brand products affect consumer purchasing behavior or not, through examining the relationship between the brand products and consumer purchasing behavior. The large farm stores, which handle bulk agricultural products, were chosen to investigate whether brand l products affect consumer purchasing behavior or not. It is an advantage to plan the marketing of brand products for the future, through theoretical study and understanding consumer purchasing behavior patterns. For this study, the survey was conducted with consumers who used shops specializing in agricultural products and lived in a large metropolitan area, for 15 days from April 26 to May 10 in 2010. For statistical analysis of the questionnaire for each question, the researchers directly visited large agricultural stores, explained about the survey, distributed, and collected questionnaires. Looking at the survey data collection, this research study was done through the metropolitan area to target consumers. Out of 290 questionnaires that were distributed, 271 were collected. With the exception of 11 unreliable questionnaires, the statistical analysis of 260 (89.6%) questionnaires has been analyzed. The SPSS / WIN 12.0 statistical program was used. In a 2009 food industry-specific results report of a department of agriculture, forestry and food survey, the percentage of consumers affected by the brand was 65.1%, and unaffected respondents were higher than 34.9%. Brand awareness and purchasing behavior to determine the quality of agricultural products affected were mostly about 71.0 percent of the survey respondents have a 'brand as a quality guarantee that will be recognized. In this study, the empirical research model that shows brand agricultural influences on a consumer’s buying behavior was designed as Figure 1. The types of products as independent variables, were divided into agricultural brand products and general food. Brand products included the variables of brand name, regional characteristics, scaling, standardization, quality management and the brand assets. Sales according to the dependent variables were limited to expanding sales of a specialty brand agricultural products such as consumer awareness, confidence and reliability of products for the consumer for the quality of agricultural products. 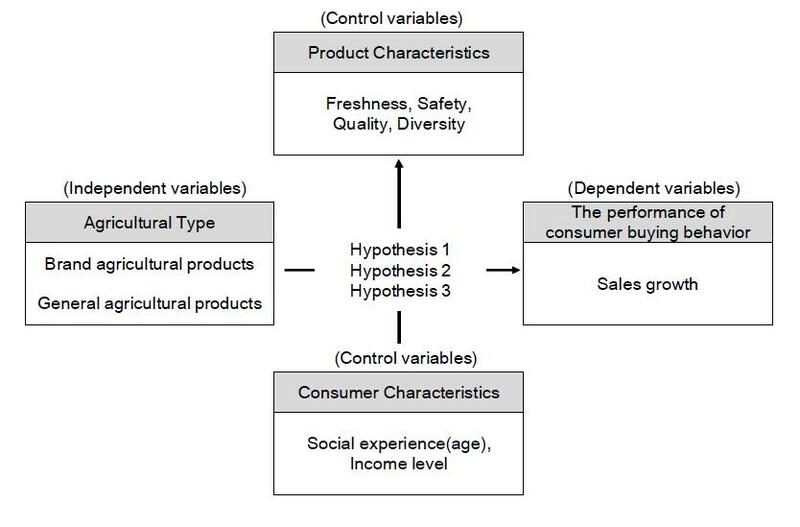 Control variables were selected according to characteristics of products such as Brands for agricultural products was limited to consumers' purchasing behavior, freshness, safety, quality, and a category. Moderating effects were examined according to consumer characteristics, including income levels. The studies (Baltas and Argouslidis, 2007; Ailawadi et al., 2001) reported that the prestige stores and the brand of product are shown to affect the consumers' characteristics and consumption. Independent labels and national brands, the attributes of the seller, store image, and store brand all have been reported to have an impact on the choice of the store and satisfaction of consumers (Collins-Dodd and Lindley, 2003; Keller, 1991; Wu et al., 2011). In addition, if consumers have the negative factor that underestimates the quality of the product, it should reflect the full effect consumer characteristics that influence purchasing behavior of consumers and situational control parameters (Aaker, 1991; Madan and Suri, 2001). The distance between the consumers and the store also affect consumers' store choice (Kim and Youn, 2010), and retail environment also affects the brand selection of agriculture from consumers (Aaker, 2000; Kim et al., 2009; Yu, 2003). Consumers are price conscious if they visit stores or buy a particular product (Thaler, 1985) and if ads do affect (Shin and Lee, 2010; Grewal et al., 1998). In addition, there are claims that the size of stores and consumer perceptions about a particular store has affected the satisfaction and store choice of consumers. Satisfaction with specific shops and brands also can affect the service quality of the product in the analysis (Oliver, 1981 Bitner, 1990Jung et al., 2006; Kim et al., 2011). The quality that consumers recognizes also appeared to have an influence on satisfaction (Spreng and Mackoy, 1996). In this paper, the conclusions are drawn through the design of the research model based on previous studies and the setting up of a hypothesis. The number of agricultural brands has increased sustainably. When this paper has the results of a survey of the Ministry of agricultural brands, brands cannot produce the end of 1999, 3,215 dogs at the end of 2006 into 6552 with an average annual growth rate of 10.7% was high. This quality guarantee for consumers that can produce reliable evidence is as important. Prefer these brands produce symptoms in the future for the brand agricultural research will be interpreted as meaning that actively made. Looking at the status of agricultural products and domestic brands, by 1812 the number of brands of food crops was registered in the legal protection of the Patent Office at 2410. Records registered the highest rates of branded items as 70.2 percent with livestock products higher. Concentrated in food crops, especially rice, which would upset the brand of agricultural products because the brand was started by a planter of rice and agricultural organizations across the country and the introduction of competitive brands and branding has shown the highest degree. In this study, a large agricultural specialty store customers who use their purchasing activities specialty store brand image for the preference for using under the assumption branded food marketing and consumer purchasing behavior relationships to examine the following hypotheses were set up. Hypothesis 1. Product reliability in brand agricultural marketing will influence more positive in consumer’s purchasing behavior. Zeithaml et al. (1996) is asserted that purchasing intention behaviors are influenced by product, service, repurchasing intention, price sensibility therefore, large agricultural specialty stores have received favorable responses from consumers because of their image that it has handled the brand product. In previous studies(Kim and Youn, 2010), it was analyzed that brands have a competitive advantage in agricultural marketing, development, and agricultural products for safety, quality management, high reliability compared to other stores. And also consumer purchasing attitude involves consumer perceiving from desirable situation individually (Kim et al., 2014). In this study, variables such as freshness, safety, quality, and variety were set considering the characteristics of food. Hypothesis 2. Freshness, safety, and various types in agricultural brand marketing will have a positive impact on consumer purchasing behavior. In the result of leading, there are a lot of research papers that state how characteristics of consumers affect a lot of satisfaction and purchasing behavior. Also, variables such as the age of social experience and income level were used as the characteristics of consumers. Hypothesis 3. The age and income level in agricultural brand marketing will have an impact on consumer buying behavior. People looking for details of those surveyed, generally look at the gender distribution of 18 male patients (6.9%), women's 242 people (93.1%) appears as a woman's response rate was high. Looking at the distribution of age, 20, 14 (5.4%), 30 34 patients (13.1%), 40 62 people (23.8%), 50 72 people (27.7%), 60 or more 78 (30.0%), etc. appeared. Less than high school education for 101 people (38.8%), a professional graduate 85 (32.7%), four-year Univ.68 (26.2%), Graduate School at least six patients (2.3%) were due. Full-time job status, the 50 (19.2%), temporary 43 (16.5%), 146 people full-time housewives (56.2%), unemployed, and 21 (8.1%) were due. 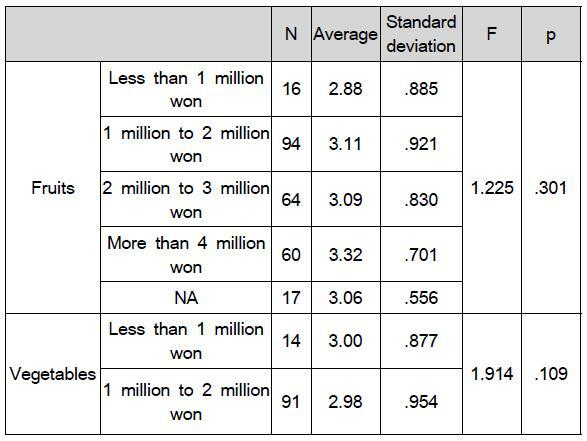 If the average monthly income of less than 1 million won 18 patients (6.9%), less than 100 to 2,000,000 won 95 (36.5%), less than 200 to 3,000,000 won 67 (25.8%), 4,000,000 won more than 63 people (24.2%), no 17 patients (6.5%) were due. Mainly to buy agricultural products from Korea, where consumers look for a large agricultural produce primarily from specialty stores that buy the majority of responses to 57.7% was accounted for over the next 24.2% two large supermarkets, wet markets were the order of 10.4%. In addition, the use of a large number of specialty stores’ agricultural products once a week for a look around and that you use to answer a majority of 48.8 percent was close to 2 times the 29.6 percent share, is about three times a week, 14.6%, 5.4% is about five times a week daily, was followed by 1.5%. Large agricultural specialty stores use about why we look at distances close to the product of the kind many abundant, respectively, 32.7% distance to near or product type many abundant specialty shops rely on the response represent the majority were convenience stores with a large parking lot next to 17.7%, a 9.2 percent because rates are cheap, the service was in order, and, because it is a 3.8%. This results in a far country for agricultural consumers' brand awareness is low that means, in particular, except for key items such as rice and agricultural products and the brand with the differences not agricultural land indicates that it does not recognize. 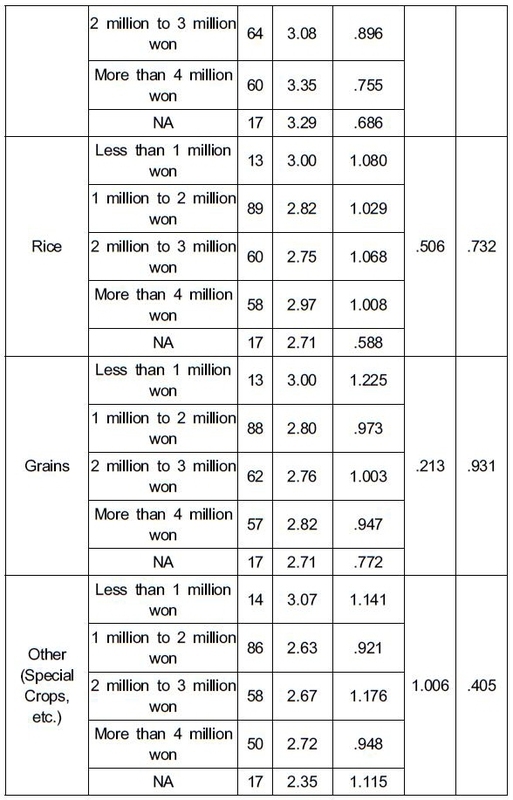 As shown in Table 1., the price of brand products being more than the price of common agricultural purchases, whether or not looking for validation, for fruits, vegetables, rice, coarse grains, and other (special crops, etc. ), had no positive or negative influence on customer buying activity. 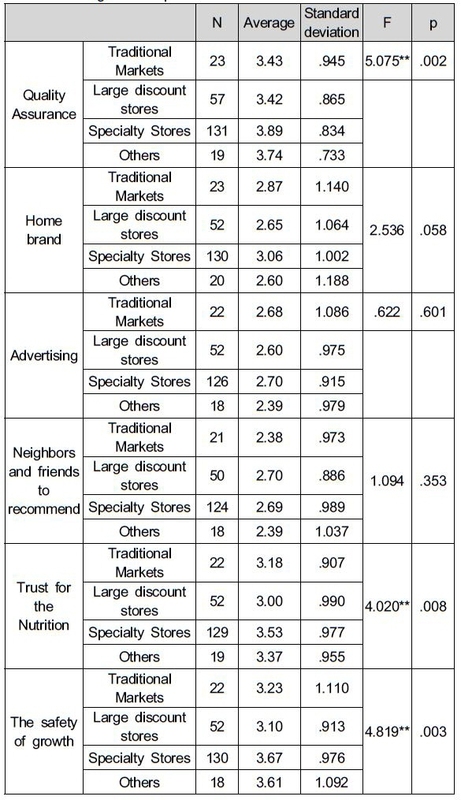 Table 2. as shown in the brand, to buy food for a reason, to verify the difference, by looking at food specialty shops and other stores by customers because of quality assurance among customers (F = 5.075, p <.01), due to reliance on Nutrition (F =4.020, p <.01), because of the safety of the cultivation method (F = 4.819, p <.01) by showing that the difference was related to the question mainly to buy agricultural brand products. As a result of post verification, quality assurance in the case of agricultural specialty stores, mainly working in groups and traditional markets and hypermarkets, groups differed from each other, shown in nutrition and safety of growth. The groups primarily used by large supermarkets and others, showed differences between the groups. However, in the groups analyzed for home brand, advertising, recommendation (from friends, neighbors, etc.) and gifts, no differences were obvious. This type of quality assurance in agricultural brand marketing, affects consumer buying behavior with a desirable positive impact so Hypothesis 1 was adopted. store food freshness for better recognition that other stores used primarily to customers was higher than in analysis (F = 5.174, p <.01) to purchase agricultural products primarily a result of post verification mainly used to produce a group of specialist shops and traditional markets are mainly used for each other and the difference between the groups was seen. 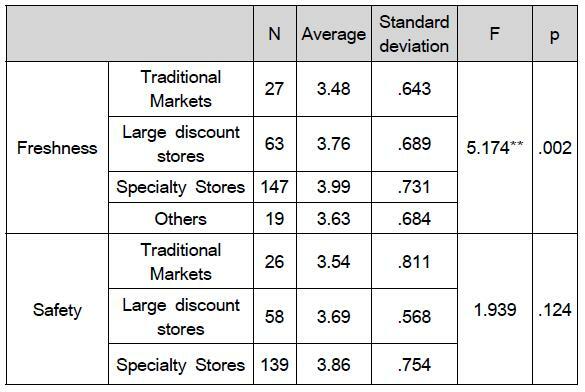 Also produce the kind of agricultural specialty store customers who use agricultural business, specialty store food of the types of good are aware that the other stores used primarily to customers higher than that were analyzed (F = 5.341, p <.001) produce mainly purchased. As a result of the Schaeffer mainly used to produce a group of specialist shops and traditional markets are mainly used for each other and the difference between the groups was seen. However, the safety, assortment, and price for agricultural products are used primarily in specialty stores and other outlets and there is no statistically significant difference between those two categories. These results were found using specialty store customers and in other outlets, on the type of food for freshness and interest in safety, assortment and pricing. Based on these results that 'brand in marketing of agricultural produce freshness, safety, and various types of consumer buying behavior has a positive impact’, Hypothesis 2 was adopted. 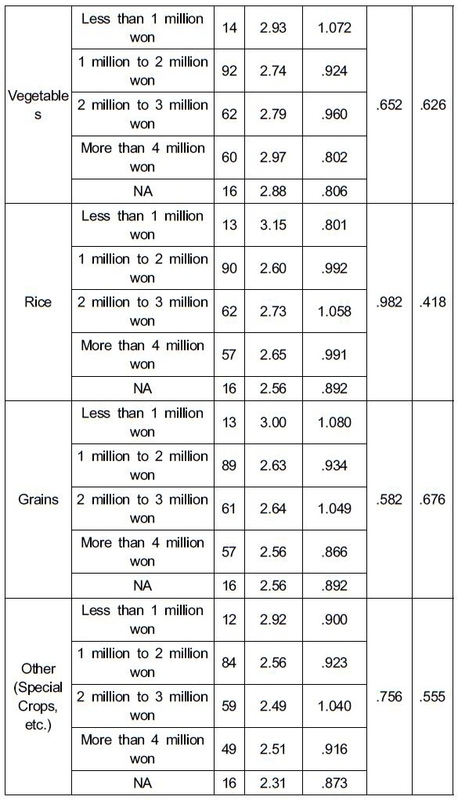 Table 4. as shown in the income gap and the related differences of buying agricultural brand products in looking for validation of fruits, vegetables, rice, coarse grains, and other (special crops, etc. ), showed no significant differences. Verification results in Table 4. as shown in the income levels of consumer purchases of agricultural products and brands showed no significant difference. Based on these results of agricultural brand marketing, Hypothesis 3 was rejected. 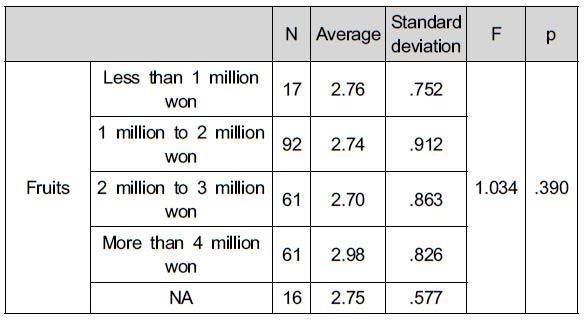 These results in general in Korea consumer demographic characteristics (income level, age, education level, etc.) vary depending on the purchasing behavior satisfaction that is present in many previous studies, but in this study produce a specific product for the consumer characteristics of the consumer buying behavior does not affect the results of the study appeared to place an in-depth analysis is considered to be necessary. These results rapid economic development and unemployment income, improvement of the domestic consumer for agricultural commodities, a change of consciousness is very evolutionary clearly shown, and the domestic consumers of agricultural products purchase behavior and consciousness level developed countries reached a level and that this the result of the analysis is confirmed by means that. 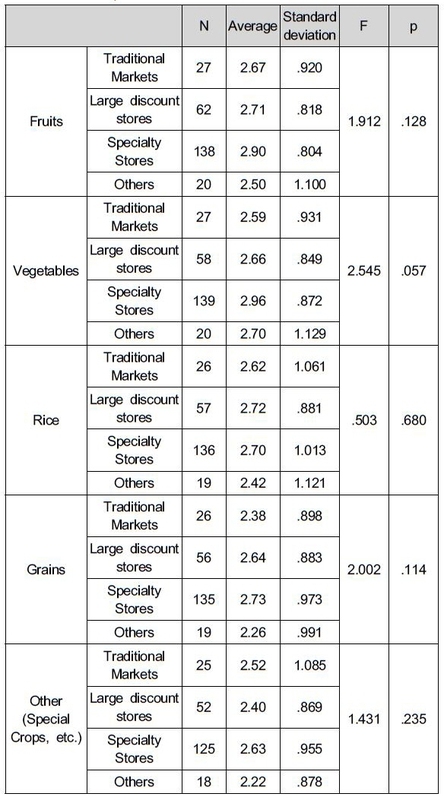 As shown above Table 5. even though the price of brand products was more than the price of generic products, and whether or not customers were looking for validation of fruits, vegetables, rice, coarse grains, or other (special crops, etc. ), there was no significant influence on customer choice, according to income level. As shown in Table 6, we look for the relationship between purchasing behavior and age, depending on differences in income and the opinions about items in an agriculture special store. The relation between the perception of freshness and safety showed r=.683 (p <.01), a positive result showingthat correlation value was of the highest degree. The relation between the degree of purchasing agricultural brand products and the comments for items of agricultural special stores is from r=.180(p<.01) to r=.262(p <.01). In the verification of age and income level the difference between purchasing at the price of an agricultural brand product and the price of the generic product plus the comments for items of agricultural special stores, is from r=.236(p <.01) to r=.309 (p<.01), which showed a positive correlation. In other words, looking at the results of this study, such as age and income demographics of consumer buying behavior Taken together, if the products of food specialty stores were desirable, the degree for purchasing agricultural brand products was high. Even if the price of agricultural brand products were higher than generic products, the purchasing rate was high. This study analyzed large agricultural specialty shops that consumers think about the positive and favorable image and appeared to be more reliable. In addition, agricultural products and branded generic brands of agricultural produce are good quality, a fresh and safe way to grow and can be eaten as a relief to have a positive perception. These are positive and favorable images of the large agricultural specialty store brands at competitive agricultural marketing strategies that you can see. First, it was analyzed which agricultural quality assurance had the positive effect for consumer buying behavior in the marketing of agricultural brand products. The empirical result was as a positive influence on consumer buying behavior. Second, it was analyzed which of: freshness, safety, and various types of products were the positive affect for consumer buying behavior in the marketing of agricultural brand products. The empirical result of them was analyzed as a positive influence. Third, it was analyzed which income levels and age of consumers were visible in the differences of consumer buying behavior in the marketing of agricultural brand products. The empirical results of such as income level and age and demographic factors were on the purchasing behavior of consumers did not provide any difference that was significant. As shown in these results, customers using large agricultural specialty stores gave a positive image for quality assurance, freshness, safety, and diversity. Consumers increased their purchases for the agricultural brand products more than for generic agricultural products because of the general reliability of quality assurance. In addition, demographic factors, consumers to purchase brand agricultural products appears to be not significantly affect the domestic consumers' purchase behavior for brand and generic agricultural products than in the past, regardless of income level and age, such as improved health and quality of life preference for the brand to produce higher were analyzed. A limitation of this study was the regional problem due to the majority of survey respondents using specialty stores in the metropolitan area. There are two types of future research: First, by analyzing agricultural brand products through a variety of consumer opinions through surveys of national agricultural findings, specialty stores and other outlets that consumers use, and then those consumer opinion surveys should be analyzed simultaneously. Second, there are studies for agricultural brand commodities, competitiveness and high quality food safety, cultivated for originating development guidance and professional and systematic marketing strategies to maintain the positive recognition and high reputation for food specialty stores of customers. 1.Aaker, D. A. (1991). Managing Brand Equity. Mac Milan, NY. : The Free Press. 2.Aaker, D. A., & Joachimsthaler, E. (2000). Brand Leadership. NY. : The Free Press. 3.Ahn, K. H., & Ghosh, A. (1989). Hierarchical Models of Store Choice. Int. J. Retail., 4(5), 39-52. 4.Ailawadi, K. L., Neslin, S., & Gedenk, K. (2001). Pursuing the value conscious consumer : Private labels versus national brand promotions. Journal of Marketing, 65(1), 71-89. 6.Baltas, G., & Argouslidis, P. C. (2007). Consumer characteristics and demand for store brands. International Journal of Retail and Distribution Manage., 35(5), 328-341. 7.Bitner, M. J. (1990). Evaluating service encounters: The effects of physical surrounding and employee response. Journal of Marketing, 54(2), 69-82. 8.Collins-Dodd, C. & Lindley, T. (2003). Store brand and retail differentiation: the influence of store image and store brand attitude on store own brand perceptions. Journal of Retailing and Consumer Service, 10(6), 345-352. 9.Grewal, D., Monroe, K. B., & Krishnan, R. (1998). The Effects of Price- Comparison Advertising on Buyers' Perceptions of Acquisition Value, Transaction Value, and Behavioral Intentions. Journal of Marketing, 62(2), 46-59. 10.Jung, Nan-Ho, Kim, Nam-Myun, & Sung, IL-Seok (2006). 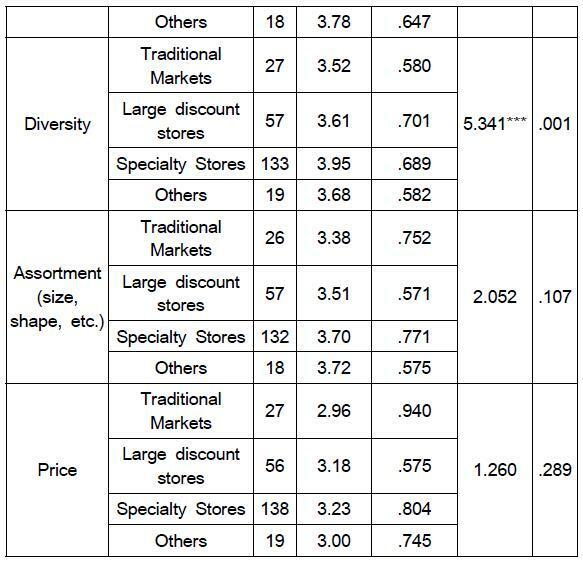 A Study on Consumer's Choice Factors for Retailer Shops :Focused on Traditional Market, Super Supermarket and Discount Store in Daejeon, Korea. Journal of Distribution Science, 4(2), 41-64. 11.Keller, K. L. (1991). Conceptualizing, measuring and managing customer-based brand equity. Working Paper, 91(123). Marketing Science Institute, Oct..
12.Keller, K. L. (2003). Strategic Brand Management. Upper Saddle River, NJ. : Prentice Hall. 13.Kim, Jeong -Ok, Kim, Mee-Lan, & Kim, Moon-Jung (2014). The Effect of Food Choice Motive on Attitude and Purchase Intention toward Organic Food. Journal of Distribution Science, 12(3), 17-24. 15.Kim, Pan-Jin, & Youn, Myong-Kil (2010). Retail Sales forecasting of agricultural products marts in a mid-sized city using the Huff Model. J. Food, Agricult. and Environ., 8(2), 945-948. 16.Kim, Pan-Jin, Kim, Wanki, Chung, Won-Ki, &Youn, Myoung-Kil (2011). A using New Huff model for predicting potential retail market in South Korea. African Journal of Business Management, 5(5),1543-1550. 17.Kim, Pan-Jin, Kim, Kyeong-Cho, Namkung, Seok, & Youn, Myoung-Kil (2009). A Study on the Customers' Awareness for Modernizing the Facilities of Traditional Market. Journal of Distribution Science, 7(1),55-70. 18.Kim, Soon-Hong (2012). A Study on the Impact of Customer Equity on Customer Loyalty in the Korean Retail Industry: Mediation of Customer Satisfaction and Switching Costs. Journal of Distribution Science, 10(11), 79-88. 19.Korea Agro-Fisheries Trade Corp (2006). All of the food brand. Seoul, Korea: Korea Agro-Fisheries Trade Corp "
20.Lee, Eun-Young (2013).T he Influence of Consumers' Perception and Attitude to Causes on Consumer, Journal of Distribution Science, 11(12).63-69." 21.Madan, V., & Suri, R. (2001). Quality Perception and Monetary Sacrifice : a Comparative Analysis of Discount and Fixed Prices. J. Pro. and Bra Manage., 10(3): 170-182. 22.Nevin, J. R., & Michael, J. H. (1980). Image as a Component of Attraction to Interurban Shopping Areas. Journal of Retailing, 56(Spring), 77-93. 23.Oliver, R. L. (1981). Measurement and evaluation of satisfaction process in retail setting. Journal of Retailing, 57(3), 25-48. 24.Shin, Hyeong-Jin, & Lee, Sang-Youn (2010). Study on Influence of Standardization of Agricultural Product Packages on Cost in Hypermarkets. Journal of Distribution Science, 8(4), 35-41. 25.Spreng, R. A., & Mackoy, R. D. (1996). An empirical examination of a model of perceived service quality and satisfaction. Journal of Retailing, 72(2), 201-214. 26.Thaler, R. (1985). Mental Accounting and Consumer Choice. Marketing Science, 4(Summer), 199-214. 27.Wu, P. C. S., Yeh, G. Y. Y., & Hsiao, C. R. (2011).The effect of store image and service quality on brand image and purchase intention for private label brands. Austrian Marketing Journal, 19(1), 30-39. 28.Zeithaml, V. A., Bery, L. L., & Parasuraman, A. (1996). The Behavioral Consequences of Service Quality. Journal of Marketing, 60(2), 31-46.